Oh hello, I was just dropping by to see if you’re hungry. Has your stomach finally recovered from the masses of turkey and stuffing, the one can too many of wiggly cranberry sauce and that bottomless bowl of mashed potatoes? Have the blisters on your feet started to subside after forty-eight consecutive hours of standing on them in an attempt to once again out-do last year’s feast? Good, I’m glad to hear it, because I’d like you come on a trip with me. The thing is, I know how much you love this season with all its festiveness and good food, but I also know (though of course you would never admit it) that part of you is secretly dreading the return of all those reindeer-shaped cookies and punchbowls of eggnog and bricks of dry fruitcake that colonize the holiday landscape like subdividing bacteria at this time of year. So let’s take break from all that for a little while, and while we’re at it, why don’t we leave everything behind – the damp, cold weather, the awkward office Christmas parties, and of course those ubiquitous red, green and gold garlands of which we’ve seen so many by now that we occasionally contemplate hanging ourselves with them just so they’ll be declared a health hazard and no one will ever have to suffer their sparkly, gaudy presence again – and get out of here completely. Instead, I’ll take you someplace sunny. Someplace warm and tropical. Someplace with beaches and palm trees. Someplace like…India. You with me? Oh good. Don’t forget to pack the sunscreen and some light reading material. And a few iodine tablets, and oh, some wide-spectrum antibiotics can’t hurt either I suppose, but never mind that, I’ll keep that stuff in my bag. What’s that you say? If sun and beaches and palms are all we want, why don’t we go someplace like Florida, or maybe Fiji? Oh, well actually because those things are not all we want. In fact, we’re not really looking for beaches and palm trees at all, I just mentioned them to get you on board with me. Sorry about that. No, the real reason I’ve brought you along on this trip to India with me is to introduce you to some great food I’ve just discovered. I know, I know, you already know an awful lot about Indian food – I realize that. You could even order saag paneer and chicken tikka masala in your sleep, right? And yes, smartypants, you also probably know all there is to know about pakoras and chapatis and mango pickle too, I get it! But our trip isn’t about any of those things. We’re going to India today to eat a type of cuisine as far removed from what your corner Indian place serves as a Big Mac is from those chopped meat patties that sailors in Hamburg used to eat. We’re going to eat some Parsi cuisine. What did you say? Did you ask what on earth Parsi cuisine is? No no, don’t worry, there’s no need to be ashamed. Not long ago I didn’t know much about Parsi cuisine either, except that I found a delicious recipe for some Parsi pakoras a year or so ago that I advocated enthusiastically on this very site. In retrospect, it was a little delinquent on my part to do nothing to enlighten either of us on the details of Parsi cuisine apart from a feeble little link to Wikipedia, but never fear, I intend to remedy that situation at once. You see, I just got my hands on a wonderful book that explains it all far better than Wikipedia ever could. Niloufer Ichaporia King is the person responsible for it, actually, and while I had never heard of her before, if you happen to be a regular at that venerable Berkeley institution Chez Panisse, you certainly might have, particularly if you’ve ever had the good fortune to get a seat for the annual Parsi New Year’s dinner she cooks there (and if you haven’t, and you live anywhere nearby, I would stop reading now and make a beeline for the phone – thankfully Parsi New Year is in March, so you might even stand a chance of not being laughed off the line). Anyhow, Ms. King, in addition to being a cook, a culinary historian and an accomplished anthropologist, grew up in Bombay’s Parsi community, and in this, her first book, has weaved a fascinating tale of her people, their history and cuisine. The modern-day Parsis, she tells us, are not a group defined by geography or language, but a close-knit cultural and religious community that can trace its roots back to the Persian Zoroastrians who migrated to the subcontinent from what is now Iran more than a thousand years ago. While Zoroastrianism itself is an ancient and fascinating religion worthy of more space than I can devote to it here, the truly remarkable thing about the Parsis is the way their cuisine has survived intact for so long, and continues to display many reminders of its Persian heritage. The Parsis love sweet and sour flavors, for example, and like the Persians add fruits like apricots, pomegranates and dates to many of their dishes, particularly those containing meat. They also love rich foods, and cream, nuts and eggs make frequent and much-anticipated appearances (in fact, the Parsis are so crazy about eggs that apparently the rest of India jokes that Parsi cuisine is anything with an egg on top). They are, however, as much Indian as they are Persian, which their complex spice mixes, penchant for palate-searing chilies and wide repertoire of pungent chutneys and pickles attest to. But the main reason you should be interested in Parsi cuisine is not because it’s so fascinating or so historical, but because it’s so delicious. In the four weeks or so that I’ve had this book on my shelf I’ve made not one, not two, but seven spectacular dishes from it, all completely different from any Indian food I’ve made or eaten before but all good enough that I would get on a plane and fly a very long distance to taste more like them. The deviled eggs, with their touch of honey and crunch of green chilies were inhaled in five minutes flat, while the buttery cardamom cake, half of which I foolishly sent home with some guests, had me sneaking quietly out of bed the next morning just so I could claim the last piece for breakfast. The best dish, however, was this long-simmered chicken curry lyrically named ‘one hundred almond curry’ that was so good it plunged the future of our marriage into doubt when one of us (I’m not naming names, but it wasn’t me!) took the liberty of mopping up ALL the leftover sauce that remained in the pot after I had dished out second helpings, though in light of the cardamom cake affair I guess I can’t be too mad. While I could easily go on for hours about the masterful balance of spices, the genius of tempering the almonds’ richness with tamarind, and the mystery of how a curry enriched with coconut could manage to taste creamier than one made with cream itself, it’s all a bit futile, really, since this is one of those dishes that needs to be tasted to be understood, and I can assure you that once you do you’ll care far less about what’s in it than where your next plateful is coming from. So what do you say? I can’t promise it will come anywhere close to the beaches of Florida or Fiji, but a quick trip to India – leaving at dinnertime, maybe? – should make all that fruitcake-nibbling and office-party schmoozing just a little bit easier to endure. And who knows, you might even come back with a tan. I produced at home until I invested in a piece of kitchen equipment that made all the difference. It’s called a wet-dry grinder, and unlike the typical Western-kitchen alternatives of blender, food processor and coffee grinder, these little marvels are specifically designed to tackle the most difficult of Indian cooking tasks, namely turning mixtures of rock-hard spices and stringy vegetal matter into smooth-as-silk pastes. The Porsches of the wet-dry grinder world are made by Sumeet, and one of these powerful beasts will be taking up residence on my counter just as soon as I’ve saved up enough money to buy one. At the moment, though, I’m relying on a very reasonable (and much cheaper) alternative – the Revel Wet n’ Dry Grinder (US – UK), which looks like a coffee grinder but can handle liquids as well in its detachable bowl. You have to be careful, though, as its ferociously powerful motor can easily burn out; short (1-2 second) pulses are really all it can handle. Oh, and about the curry: feel free to make it with shrimp instead of chicken, in which case just add some peeled raw shrimp to the finished sauce and simmer until they turn pink, or you can easily go vegetarian by adding 2 halved hard-boiled eggs per person just before serving. Also, you’ll find that like most curries, this one just keeps increasing in flavor as its sits, so do your best to have leftovers! For the masala, in a heavy skillet, toast the chiles, coriander, poppy seeds and cumin over medium heat until the seeds turn brown and everything smells toasted. If you have an Indian-style wet-dry grinder (see above) grind all the masala ingredients to a paste in it. If you don’t, start by grinding the toasted spices along with the cloves, cardamom, peppercorns, cinnamon and turmeric into a fine powder in a coffee grinder (it’s best if it’s dedicated to this purpose, since your coffee will taste like curry otherwise!). Combine this powder with the almonds, garlic and ginger in a food processor. Pulse until the almonds are finely ground. Add the water, starting with the smaller amount and adding only as much as necessary, and process the mixture to as smooth a paste as possible. For the chicken, heat the oil in a deep, heavy-bottomed pan over medium-low heat. Add the onions and sauté them gently, stirring occasionally, until they are golden brown and highly fragrant, about 30 minutes. Increase the heat to medium and add the masala paste, stirring for a few minutes until the aroma rises. Watch it carefully as it can scorch easily on the bottom. Add the chicken thighs, water, coconut milk and 2 teaspoons salt. Bring this mixture to a boil, reduce the heat slightly, and let it cook gently, stirring occasionally, for about 45 minutes, or until the chicken is fork-tender and has started to pull away from the bone. Remove the chicken to a plate with a slotted spoon and increase the heat to medium-high. Boil the sauce, if needed, until it thickens to the consistency of heavy cream. When it’s as thick as you prefer, stir in the tamarind and jaggery to taste (it should be just slightly sweet-sour), adjust the salt, and return the chicken to the pot. 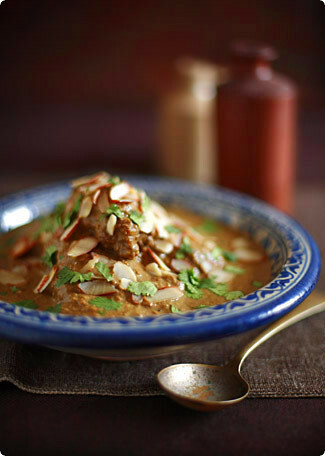 Serve hot, garnished with chopped cilantro and toasted sliced almonds, and accompanied by rice or naan. Dal and a green vegetable dish also make wonderful accompaniments. Funny to see your post about Indian/Parsi cuisine as I have been stuck into it too as of late. You are surely tickling my curiosity with this new kitchen utensil. Will I have room to justify it in front of my suspicious hubbie? Seven dishes from the same book must be a good reason, indeed, to indulge in the purchase. This one, is just lovely, and mouthwatering. Only wet-dry thing I’d ever heard of was a wet-dry vac. Also handy, but not for the same purpose. this sounds delicious, may have to give it a try. I’ve read that a coffee grinder can be cleaned of coffee or spices by whirling a piece of bread without the crusts in it until it’s clean. It works like a sort of sponge wipe! Also, my mom told me about the Mixie! I think she’s weighing it against a new processor. As soon as I read this, it jumped straight to the top of my ‘must try’ recipes. I went to the markets this morning and made it for dinner this evening, and it really was every bit as delicious as you promised! Indian food never turns out as well as I want it to, but this was absolutely great – reasonably easy and so tasty – it’s definitely going in my recipe folder for good. I halved the chicken and left out the water as I was only cooking for four, and it was fine. And there’s leftovers! Yum – thanks! This is really fascinating, I have a friend who has taught me a lot about Persian cuisine, and what could be better than the combination of Persian and Indian cuisines?I strongly believe that all great cuisines have that sweet-sour element, whether it’s pomegranate molasses in a Middle Eastern stew, mostarda in Italy, umeboshi in Japan, etc. I believe Niloufer contributed several recipes to the SF Ferry Market Cookbook, which I’m going to go retrieve from my bookshelf. Wow! I know exactly what I’m making with the chicken in my fridge tonight. Just… wow. Yes! I’m with you. Great food with sunshine and heat as an ingredient — nothing would cheer me up more this terribly gray and windy December day. I’m just going to dig out my swim goggles and I’m ready to go. hi there! I admire your writing and have been a frequent visitor without commenting! This recipe looks delicious.I’ll substitue the chicken with cauliflower/potatoes or even tofu.Hope that works! Just wanted to mention that I usually grind my spices with the Oster blender…I feel the blades are sharper compared to others! So far it has outdone my mixie or wet grinder which I use for grinding dosa and idli batter! hey hey… i dont know about the UK, but in the US, i purchased my ultra grinder(for dosa/idli batter) from innoconcepts (www.innoconcepts.com) they have prompt customer service..unfortunately they didnt sell the coconut scraper attachment at that time(sharp blade..probably restricted for shipping or something weird and legal like that). they also sell sumeet ‘mixie’ grinders. found this > http://www.innoconcepts.com/sumeet.htm . altho’ i have to say, i had the asia kitchen machine once and it was rather tedious to use. the older and simpler sumeet models were better. this is also a good choice for wet/dry mixie grinder> http://www.innoconcepts.com/meenumix.htm. and you are right. most indian kitchens will be running on a handicap without a wet/dry grinder. my to-go parsi cookbook is by katy dalal, jamva chaloji..both volumes. > http://www.amazon.com/Jamva-Chaloji-Parsi-Delicacies-Occasions/dp/8187111062 and http://www.amazon.com/Delicious-Encounters-Katy-Dalal/dp/8187111445/ref=sr_1_3?ie=UTF8&s=books&qid=1196652003&sr=1-3of course, i paid considerably less for them in india. i am shocked at those prices. I am sitting at my computer in Geneva where it is raining, raining, raining…. You would think you were in England and not Switzerland. So I cannot tell you how welcomed your journey to India was 🙂 Not to mention my weaning on curry (English father and all) and true love of all related dishes, particularly those based on almonds!! Thanks for the wet/dry grinder suggestion & must say that such dished can be difficult to photograph and you have done a wonderful job. PS I have never used frozen coconut milk does it work well? Ahhh, Melissa — this sounds like a dish that will heal all that ails us during the holiday season — and our ailments, holiday and otherwise, are considerable. I love Persian cuisine with the passion one reserves for a kind of food that doesn’t exist to any great degree in the city where one lives; and although NYC boasts lots of Indian restaurants, not many of them are very good — to G’s eternal sadness, since Indian might be his favorite cuisine of all time. So this recipe is very much for us. I’m toying with the idea of using lamb…what do you think? I have been on the waiting list for the summeet for 2 years – maybe heading for 3 years in March. We have an order in for 2. Williams Sonoma had a whole spread in their catalog at the time I ordered these – and they never got them to sell so they refunded my money. I then ordered them directly from the headquarters in Canada and am still waiting. There was a flood, they moved the factory, they will be in on Friday, they had to reconfigure a part, emails arrived saying they should be here shortly…..and we are still waiting. If you know of a secret source, special mantra, anything that would get one of these babies into my hands you will be crowned queen of the kitchen and blessings said in your name. Bea – Re: justifying kitchen equipment to suspicious hubbies, you can try the strategy I use: just start slipping it into conversations innocuously, occasionally lamenting that certain things you make would be SO much better if only you had one. It’s never failed me yet 😉 Kevin – You’re not the one one to make that association. I can’t tell you how many times google assumed that’s what I was really looking for… Anita – I’ve been fascinated by regional Indian cuisines for as long as I can remember, but up to now it’s been so frustrating how few good Indian cookbooks existed for the western market! Thankfully that seems to be changing. I’m sure that even these new books are only scratching the surface, but until I can arrange a long trip there myself, they will have to do!June2 – I’ve heard that about bread (and raw rice too), but I’ve never tried it myself either. It’s hard to imagine that it could get every last particle of spice, though, isn’t it?Emily – That might win the ‘fastest recipe feedback ever’ award! I’m so glad you liked it :)Mercedes – Sign me up for the sweet-sour fanclub! All of my favorite cuisines, at the very least, have this as a defining element, so I heartily agree with your sentiment. Did you find anything else of Niloufer’s in the SF Ferry Plaza cookbook?Ash – Great tip on the Oster blender, thanks. And yes, I’m sure this would be absolutely delicious with vegetables and tofu!Erika – I haven’t actually used frozen coconut milk (it’s not available here as far as I can tell), so I can’t say whether I prefer it to canned. Some people say it tastes fresher, though.Faustianbargain – You’re just a font of useful information! I’d never heard of Innoconcepts grinders, so thanks for the tip. Are they as good for masala pastes as they are for dosa/idli batter?Julie – I think it would be wonderful with lamb. Do let me know! And that G. of yours, he sounds like a man after my own heart… Maureen – Hmm, I wish I knew what to tell you! From doing some googling, it would seem that some places do have it in stock, such as Bombay Limited (follow the link I gave for the Revel grinder above and go up one level to see all their ‘mixies’). I’ve never bought anything from them, however, so I can’t give you a personal endorsement, but it seems worth a try, no? Three years is simply too long to wait! I am a vegetarian so can’t comment on the recipe, but loved your story. I have 2 parsi friends, so know <u>exactly</u> what you mean. M, the asia kitchen grinder or the meenu mix is good for the masala pastes. I have just returned from Bangalore where I bought a Philips mixie from Vivek’s. I inquired about the Sumeet mixie as I too have read about them from their website and also have considered placing an order….the staff at Vivek’s told me that Sumeet was a family business and they are no longer in business. I don’t know whether that is true, but I’m happy to report the Philips model I purchased has today made the smoothest hommous and also the best slushie-consistency frozen margarita from ice cubes, not crushed ice. Both tasks are something no blender has yet been able to the accomplish for me, after many years of trying. Maureen, time to give up on your order and move on – try a different brand to Sumeet. One thing I learned in India is that Mixies (wet-dry grinders) are standard equipment – there are many makers and without having tried them all, I get the impression they all do the same thing. My model is 600 watts and lets me do continuous grinding, not just pulsing as Melissa’s machine seems to be restricted to. I haven’t tried the dry grinding yet but I’m looking forward to it! The bigger mystery to the Sumeet machine is: why is the technology in these mixies not also standard in western countries and brands? I’ve looked my machine over carefully and have concluded that it is the sloping design of the canisters and the blade design that gets the results – this is not hard, why can’t you get this everywhere??? Thank You, It is sooo great to see anything to do with Parsis as i am one, and have’nt seen any of our dishes come out to the world. trust me there are some absolutely fantastic dishes, we make. Definitely looks like a must try for me. Anything chicken and I'm your man.